I like to think of this as a Change-Your-Partner’s-Snoozing-Ways Clock. Before we had kids to wake us up, my husband would snooze for 45 minutes. Not cool. 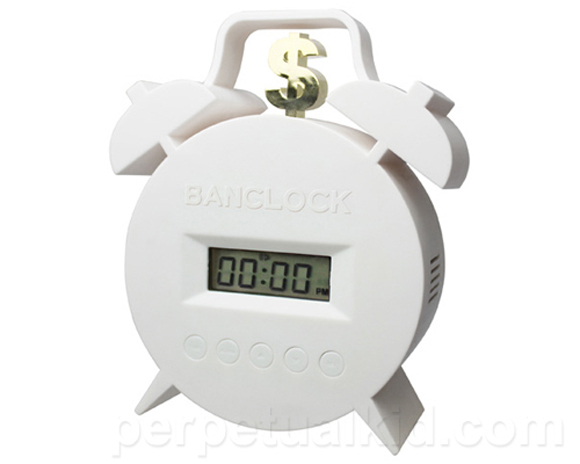 Now if Mr. Sleepyhead had to pay for every push of the evil button that’s made for the lazy, he might rethink his wake up “process.” On the contrary, the retro-looking twin bell alarm clock just might become your best savings plan yet. Think of it as a retirement fund for the perpetually late and chronically never well rested.